Home » Dojo Highlights » Structure, Discipline, Etiquette and Respect… Hai! Structure, Discipline, Etiquette and Respect… Hai! Posted by aikidoesc on Apr 13, 2015 in Dojo Highlights, Featured, The Dojo Posts | Comments Off on Structure, Discipline, Etiquette and Respect… Hai! Kids crave structure and discipline… well, we all do to some degree, don’t we? At Aikido of Escondido Martial Arts Dojo, yes, we teach children and adults the art of Aikido, but inherently in the practice of it comes self confidence, self discipline, self development and self control. Whether you are a child or adult student, the rules create a safe environment for all to train and contribute to your overall success in the art of Aikido. As you read the Dojo Etiquette, General Dojo Rules and Formal Class Procedures detailed later in this post, you’ll start seeing the respect that we have for each of our students, the respect we have for the dojo training facility and the art of Aikido and the responsibility we feel to provide the best possible experience to each and every person who we have the honor of training. Please feel free to stop by and observe a class to get the full “Aikido Experience”. (See Class Schedule) You might even decide to start training yourself and the rest of your family…. Etiquette is not simply tradition; it is part of your practice. Observe it respectfully. Remove your shoes and place them neatly in the designated area. Wear your Zori (sandals) from the changing area to the mat. Line them up on the right side of the entry pointing out. Address the instructor as “Sensei; this is Japanese for teacher. Be on the mat and ready to go at least 5 minutes before the scheduled start of class. If you are late for class, change quickly, bow upon entering the practice area, then sit quietly off to the side in the seiza position until your instructor gives you permission to join the class. Bow to your instructor when called upon to assist in demonstrating a technique; bow again and sit when done. Bow when the instructor has finished demonstrating and has directed the class to practice. Your fellow students, like you, are striving to learn. Please cooperate and learn from each other. When your instructor claps, sit down again in neat lines. Should your instructor advice you on a technique during practice, thank him and bow. If you need to leave the practice area for any reason, bow and thank your partner and then ask your instructor’s permission to be excused. Do not talk while your instructor is lecturing or demonstrating. Bow when changing partners during class. At the end of class, bow to everyone in class, especially those with whom you practiced. Proper observance of etiquette is as much a part of your training as is learning techniques. Preserve common-sense standards of decency and respect at all times. Remove all jewelry before practice. It can be dangerous to yourself and others. Do not chew gum, eat food/candy or drink in the practice area. Keep your toenails and fingernails trimmed properly. Keep your gi (uniform) and body clean, as well as your mind. Do not leave your gi at the dojo; take it home and wash it or air it out. If watching a class and at all times, move and talk quietly so as not to disturb a class in session. Volunteer your services to keep the dojo clean. If you see something that needs cleaning, simply do it. If you can not, tell someone who can. Respect the dojo (practice area), its instructors and fellow students; they make your training possible. Zori (sandals) must be worn to and from the mat. A customary bow as you enter the training hall and before you leave is required. Try to be in the dojo facility fifteen to thirty minutes before the scheduled beginning of class. Punctuality is important. Allow enough time to make a smooth transition from street to dojo. The feeling will carry over to the class and enhance the training. A customary bow as you enter the training hall is required. The mat should be cleaned before the beginning of the first class. The mat is where we meet to train and its condition sets the tone for the dojo and the training that take place upon it. If you are early, feel free to volunteer your services. Your help is greatly appreciated. The instructor will signal the students to line up facing the front with the senior students starting the line from the right side. 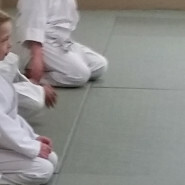 The instructor sits seiza (formal kneeling position) in front of the class, facing shomen (front wall). The senior student or assistant instructor calls out “Shomen ni rei!” (bow to the front) and all bow. The instructor turns to face the class and the senior student or assistant instructor calls out “Sensei ni rei!” (bow to the instructor). All bow, saying :Onegaishimasu” (please share). The class begins. The instructor signals the end of the class. Students sits seiza facing shomen. The instructor sits seiza in front of the class, facing shomen. The senior student or assistant instructor calls out “Shomen ni rei!” and all bow. The instructor turns to face the class and the senior student or assistant instructor calls out “Sensei ni rei!” All bow, saying “Domo arigato gozaimashita, Sensei” (Thank you very much teacher). The instructor signals for all the students to thank each other. All students bow to and thank everyone with whom they practiced during the class. The mat should be cleaned after the last class. As before, your help is much appreciated. A customary bow before you leave the training hall is required. Remember, safety is the first priority of the dojo. All rules are meant to keep the students from getting injured and contribute to their success in the art of Aikido.